My ear is hot and wet. The blanket over my head muffles the sound of the road beneath the car and rubs the edges off the words that my mum and my father are saying. When we talked about this trip, I thought there would be singing. No one promised singing, and I’ve never been in a car before where people have sung – I’ve never been in a car before – but I still feel a little bit let down. For some of the way here, I considered singing to myself. And no one specifically said that I couldn’t, but they did say I couldn’t talk, shout, laugh, sneeze, ask for food, burp or hiccup. So I figured, no, best not sing. I knew we’d have to play the blanket game though. So I don’t feel let down about that. But I do feel hot. The side of my face that’s pressed into the car seat feels warm and slimy, even though the ridged leather is smooth and was cool when we left, hours ago while the sky was still jet black. The cheek that’s facing up to the car’s roof feels itchy and raw. The blanket covers the whole of me, all the way down from the new haircut on my head to the old shoes on my feet. In the boot of the Standard Eight is a bag for each of us. Just one bag, so it will look like we’re only going on a small trip. It looks like all our other things are back home, waiting for us. And they are back, way back, over the water but I mustn’t call that place home. And I mustn’t think that anything behind is waiting for us. Only what’s in front of us is waiting for us. And we each have a bag for that. If anyone asks, I’m to say that we’re on holiday. My mother and my father hope that no one asks. They didn’t tell me that but they told each other, when they thought I’d fallen asleep in my hiding hole behind the fire. “He’ll give us away in seconds,” my mother had said, her voice squishing into my father’s chest. “Darling, we’ll be done for,” said my father in his crisp radio English. And then they both laughed. But it wasn’t a happy laugh. The car, a small case of money and some bits of paper were given to my mother by a well-off farmer back at the place that I mustn’t call home. Father said we were ripped off, he always says that word like “orf” and I always try not to laugh. He says that the other farmer would never have tried “dirty tricks” if he’d known he was dealing with a man as well as a woman. “It’s him I’m angry with, darling, you had no other option,” is usually the end of the conversation. They’ve had the same conversation many times on this trip, talking over each other to finish it sooner, and then start it all over again. Only once has my mum said one more thing. “That was my father’s farm,” she said, “he’d turn in his grave”. It’s Liberation Day and everyone is happy. I’m happy because Mum says that there will be more food now, and that the soldiers will leave and that the islands will be ours again. But Mum and Father don’t look happy. The men who were in charge are no longer in charge. And those men would have hurt my mum as well as my father if they’d found him. But those left behind will hurt all of us, and those left behind will never leave because this is their home. The islanders were here before the soldiers, and they’re here to wave them away. The blankets will be shaken, the carpets beaten, the curtains thrown open and the holes sewn up. But no one will ever forget. My parents have already started to plan something. I heard them talking last night while the sounds of freedom poured from the wireless, quiet but unstoppable, like a split bag of rice. “They’re calling it Victory Day,” Mum had said to my father, without looking up. “We need a car and we need some money,” Father had said in his steady voice. “We need a plan first,” said Mum. And she had put down the thing she was sewing, and looked at Father until he looked away. “Are you feeble-minded or something, Sammy?” Mum had whispered hard as she pulled me away from the window where I’d been watching the soldiers far off in the distance, their dark uniforms making them look like small, busy bugs. She shooed me away from the thin glass and I scurried back behind the stove where it’s always warm. There’s no shortage of wood to keep us warm here, but it has to be chopped quietly so my father chops at night. I worry about him slicing his thumbs off. “Don’t ever call him feeble-minded,” my father said, his voice the loudest I’d ever heard in this world of whispers. “Keep your voice down, Sid.” My mum was near silent, furious. She tried not to say more, I could tell, but eventually said, “he’s my son, and I’ll call him whatever I like.” I couldn’t hear my father’s reply, but I saw my mother’s mouth drop in surprise. It’s bedtime now and I’m tucked into my drawer, woolly ted tucked tight in with me. Normally it will be a couple of hours before my father is lying alongside me in his own blankets, so I’m surprised when he says he’s coming to bed now. That he wants to tell me something. My mum strokes my hair, kisses the bridge of my nose in a way that always makes my eyes close no matter how hard I try to keep them open, and crawls back out into the kitchen, where I can hear her humming as she darns our socks and hems our trousers. My father crawls in. I see his huge hand hovering over my hair, but he changes his mind and pats my arm instead. The men that visited today had come for the tomatoes. That’s what they said. I didn’t realise at the time how strange that was. The thing is, there are tomatoes growing everywhere on Guernsey. Everywhere. You can’t move for tomatoes at certain times of the year, Mum says, although I’ve never seen them anywhere except our garden. Mum, I think, knew full well that it was strange for the men to come all this way up our track for tomatoes that they could get anywhere but she had to let them in anyway on account of the uniform that they were wearing and the way that all of that works now. My father and I were hastily tucked in behind the fireplace, which is what we always do when knocks come. Only today, it was me that hugged my father and kept him safe and quiet, and not the other way round. I felt very proud that I got to be all manly, but then I mostly felt sorry for my father because he takes looking after us very seriously. After the men left and the heavy front door slammed shut, I could hear my mum crying. My father had scrabbled out of my arms and into the kitchen, calling quietly for her. “Hilda,” he said, in his sharp way that made the word shorter than it was. She didn’t reply, she just cried harder and when I eventually found my parents in the living room, they were tangled up in each other and both of their faces were shiny with tears. I sat on the red chair near to them and waited a really long time for them to stop making their little bubbly noises, to shake their heads and then to go to put a kettle of water on the stove. And now my father is holding one of my hands and my mum is holding the other. Her hands are all quivery like a little bird’s heart under its breast feathers. Her fingers are so jittery that she’s had to put her teacup down. My parents aren’t really saying much, just that I was a good boy for staying quiet and that I’m not to worry about what I heard. So I won’t. There’s a hospital on the island. I only know about it because, a few months ago, my mum ended up in it and she couldn’t get home to us. She’d fallen over when she was helping to unload the medicines that had arrived by boat from somewhere or something called the Red Cross. It was lucky, I suppose, that she fell over and hurt herself once the medicines had arrived, and not before. Although, I suppose, she wouldn’t have fallen over at all if it wasn’t for the medicines, so I don’t know if the medicines were a good or a bad thing, overall. I get stuck in thought-loops like this all the time. It can make my mum really cross because she’ll be talking to me and I won’t hear because I’ll just be following a thought around and around in my head, trying to tie the ends together. When she didn’t come home that night, my father was agitated but he kept saying that she was probably asked to sleep in one of the warehouses so that she and the other women could work through the night. The next day, my father crawled out on his belly and came back with some bottles and some biscuits. The bottles were to wee in. She was away for three days so we had to play opposites. Night was day and day was night. We ate breakfast in the dark with just a candle, and we tried to sleep while we hid from the sunshine. My father did a very good job of not worrying me. He told me stories when I got scared. All about fishing with sticks in huge, wide rivers and climbing really tall trees in a faraway land called the Black Forest. It was only when my mum came home and told us where she had been that my father admitted that he had been frightened. The hospital was underground and it sounded like a big pipe with beds in it, but a pipe that wasn’t quite dried out because Mum said everything was a bit wet, even the bedding. She said she was happy to be able to go to bed in her own sheets and then she stopped herself and reached the tips of her fingers to touch the tips of my father’s fingers and they just stayed like that until I said I was hungry, and I think I broke their spell. My mum always called our home a ‘farm’. It was even in the name, Le Petite Ferme, which she told me meant ‘The Proud Farm’. My father told me what it really meant. He wasn’t being cruel, just precise. He didn’t know how to be cruel. I think that might have been part of the problem. It was a little farm, “a smallholding,” my father explained, although I still don’t know the difference. For most of my life we’ve had Bluebell the cow, some vegetable plots, a few rows of fruit trees, eggs from ‘the girls’ and four greenhouses for tomatoes. 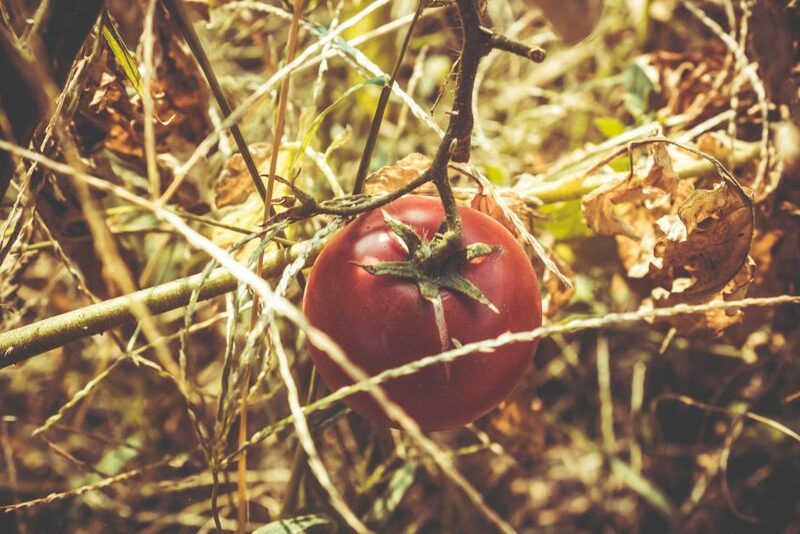 Like most of the island, tomatoes have been a big part of the little farm since before the war. The whole place smells of their stems, their earth. Even outside of tomato season, I can sometimes feel the sting of too much juice under my nails. We have one ration book, for my mum and my mum alone. My mum is an experimental cook, and she writes down all her careful experiments so she can study them and make them better. Meatless roasts, cauliflower mash, tomato jam and flourless cakes. “Biscuits. Little biscuits,” my father called the flourless cakes. He ate every crumb. When my father first came to us, he used some of the wrong words for things. So when Mum did the laundry or sorted out the kitchen, she would hold up each item, saying its name out loud like she did when she was teaching me. “So much better,” my mum would say, smiling. Tonight, like every Sunday night, we sit at the bottom of the big cupboard with all but one of the candles snuffed. Our ears are pressed to the rough wireless speaker and we’re listening to J.B.Priestley’s Postscript very quietly on the BBC. In the dim light, I can see the outline of my father’s mouth practising the words he hears. Crisp, British words. Our words. His words now. I got a father for Christmas this morning. He showed up wrapped in a thick wool uniform. It was dark and smart. I don’t think he knew he’d be my father, but I knew right away and I know now as I watch him climb behind the fireplace where my mother puts me to bed in my drawer. It seemed a waste when my mum poked the smart uniform into the stove to burn it down to its buttons. While the fire spat, my new father sat wrapped in an old coat and my mum sorted some clothes into piles. She’d got them out from the side of her wardrobe that she never usually opens and they smelt sweet and dry, like old perfumed paper. Soon she had worked out which clothes my new father could fit into, from those left behind by my old Daddy. The one who isn’t ever coming back. The one who didn’t know I was on my way. Because nobody knew, except Mum. If anyone knew I was here now, they’d send me away to keep me safe among the chimneys of Stockport or the factories of Oldham. I’m my mum’s favourite secret, she says. But she has another secret now too. I don’t know when she first met my new father, when she heard his story or told him hers. But he’s here now and he’s staying. Earlier, when they thought I was napping, I crawled out of my drawer and peered out from behind the stove. I saw them standing beneath the sprigs of Christmas holly that my mum had strung up across the kitchen ceiling. My new father put his hand on her waist, the other tilting Mum’s face up to him. “They will call me a deserter,” he said, his accent thick and stilted. “They’ll call me a jerry bag,” my mum said. And they both smiled, and kissed a tiny kiss under the red berries.